This really depends on the size of your room, how many windows, what year the house is. A good general rule of thumb is if you place mats all across the room, it can be equivalent to a small space heater. So if you want to know how well it heats up, place a small space heater and after an hour or two, thats what QuietWarmth can provide in your room. The benefit of having QuietWarmth is no maintenance and no risk of space heater catching on fire. 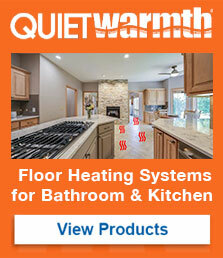 PreviousPrevious post:Best Underlayment For Laminate Flooring On ConcreteNextNext post:Do You Need QuietWalk with QuietWarmth Floor Heating System?